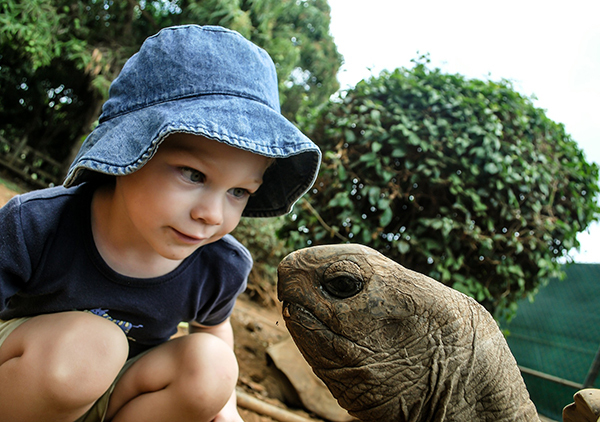 If a child grows up never seeing animals in their natural habitats, he or she may never fully understand what could be lost in the climate-changed world of the future. Today, the average American child is by far an indoor creature, spending only four to seven minutes a day in unstructured play outdoors and more than seven hours a day in front of a screen. Those almost unbelievable statistics were reported in a recent article published by the Child Mind Institute, and they’re a near reversal of where we humans started out. At one time, we lived and learned mostly out in the fresh air. But once we migrated to predominantly indoor spaces, we lost something important: the opportunity for our children to turn over rocks to see what’s underneath, smell flowers, touch dirt and wade in puddles. Learning became primarily theoretical; we use pictures and representations of the world instead of the world itself. Recently, however, some have begun to see the beauty and necessity of educating kids outside the traditional classroom. Others hesitate to offer lessons in nature for fear that children will act “wild” and be unable to concentrate afterward. But research shows that the opposite is true: students score significantly better in classroom engagement and focus after having lessons in nature than they do after classroom studies. It’s well documented that spending time outdoors is good for our physical and mental health. But it’s also good for learning—and in the world that our children will inherit, it’s going to be more important than ever that we get them outside into nature to do it. Multiple studies show that when children spend time outdoors, their learning improves. 1. Better grades. In 1998, Dennis Eaton from the University of Toronto published a thesis, titled Cognitive and Affective Learning in Outdoor Education, which concluded that students’ cognitive abilities are better developed outside the classroom than in. 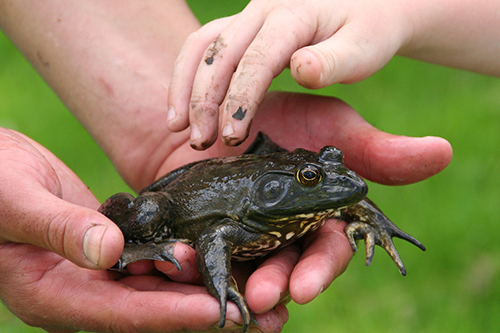 A 2015 academic paper, titled Empirical Evidence Supporting Benefits of Outdoor School and Experiential Learning Programs, pointed out that two studies in California that compared 12 pairs of schools—which had been matched using demographic and socioeconomic criteria and information about their environmental programs—found that students involved in environmental education programs and programs that use hands-on, outdoor learning outperformed students in traditional math programs. Learning outdoors has also been linked to a spark in creativity. 2. Improved memory. One way to improve recall is to experience something new and unfamiliar, which releases dopamine into the hippocampus where memories are created. Indoor classrooms are typically the same every day, with the same layout, lighting, temperature and scenery. But moving classes outside opens up a world of fresh, sensory stimuli that have the power to secure in our brains whatever information is being learned at the time. The real world that you can touch is often better for learning than pictures and representations of the world. In a study published in 2013 in the Journal of Adventure Education and Outdoor Learning titled Learning Biology and Mathematics Outdoors: Effects and Attitudes in a Swedish High School Context, researchers conducted a seven-month investigation at an urban high school in Sweden involving 84 students. Compared to the students who received indoor classes, the students who received outdoor biology instruction exhibited increased levels of long-term knowledge retention and used higher frequencies of course content-related words to describe course activities and content vividly. In contrast, students who received indoor instruction provided relatively content-free, elusive and vague descriptions of the course content and activities when interviewed. 3. Increased motivation. In a study published in Frontiers in Psychology in December 2017, educational psychologist Ulrich Dettweiler at the University of Stavanger in Norway and his research team found that students in the lower secondary levels who participated in an outdoor education program as part of their science curriculum reported significantly more intrinsic motivation to learn and felt more competent. More recently, in the June-July 2018 issue of National Wildlife Magazine, it was noted that researchers at the University of Illinois discovered that third-graders at the Cold Spring Environmental Studies Magnet School in Indianapolis, Indiana, were found to be more attentive and engaged in their indoor studies following a 40-minute lesson conducted outdoors in a natural setting. This “nature effect” allowed the two educators who participated in the project to teach their 50 students uninterrupted for almost twice as long as would have been possible if the students never left the classroom. In one study, children were more engaged in their indoor studies following a 40-minute lesson conducted outdoors in a natural setting. 4. A gain in skills. Obviously, the most effective way to learn new, outdoor skills is by practicing them—outdoors. 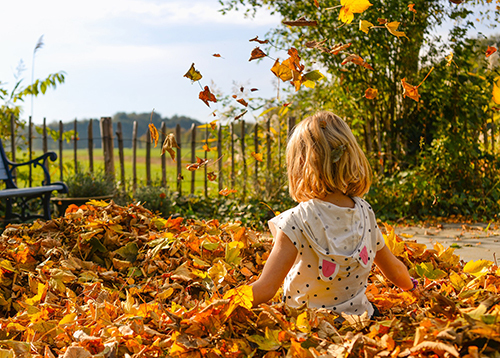 Activities such as using a compass, identifying edible plants, building a fire or navigating by the sun are know-how that kids soak up in open-air classrooms. 5. Environmental knowledge needed for living in the world of the future. Our children will live in a world far different from the one we grew up in. While we may have heard minor rumblings about acid rain, a hole in the ozone layer or disappearing rain forests in our childhoods, the threat of climate change has become fully realized in theirs. The need for citizens who are concerned about the well-being of our environment is greater than ever. Unfortunately, instead of fostering a connection between children and the outdoors, we’ve divorced nature from childhood, putting conservation efforts in jeopardy. If a child grows up never seeing animals in their natural habitats, digging in the soil, playing in a stream, walking in the woods or staring at the ocean’s rhythmic waves, he or she may never really understand what there is to be lost. 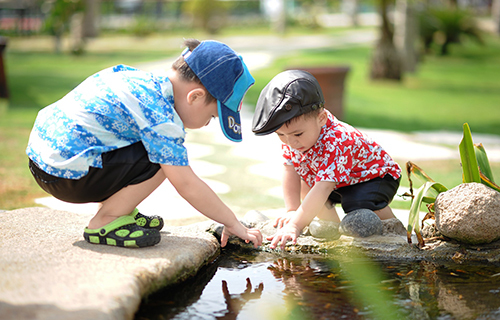 Children who have a high sense of connection to nature are more likely to engage in pro-environmental behavior, such as recycling and saving water. In American education today, the dominant trend is increased reliance on indoor, digital experiences. But nature-enhanced education represents a strong turnabout, one that does not reject technology but balances the virtual with the real. Outdoor lessons are a cost-effective way to improve our children’s educations. Let’s pledge to get them outside more. Progress is being made in that direction. For example, in Virginia, a garden that is a topographically correct, scale model of the state with indigenous plants is used by educators to teach fourth-grade history classes. Some school grounds around the country now have boulders to climb on, walking trails and vegetable gardens that help supply homeless shelters. 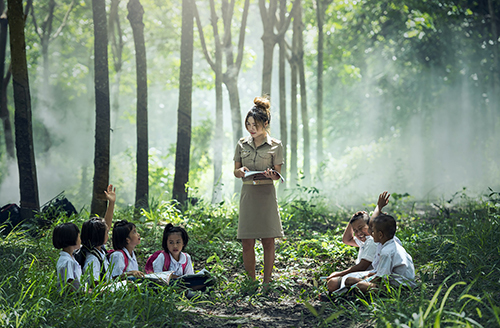 English teachers may encourage students to write poetry under trees, and biology teachers are letting kids get their feet muddy in creeks at the end of schoolyards. Outdoor lessons are an inexpensive and convenient way to improve student engagement in learning and raise test scores. For far too long, we’ve been nature-starving our kids, leaving them unprepared for the world they’ll have to live in. Naturally, then, we should now want to give them the best chance at learning. An interesting article. As someone who has worked with many schools engaging children in the outdoor learning environment i can offer a possible answer. When working with teachers and showing them how to use a natural green environment as a learning resource i was often asked why they had never come upon it in teacher training courses. It is this failure with educational training which can and should be addressed. I often help teachers to teach different aspects of the UK national curriculum outside in the garden or in the broader rural environment. They tell me the the response from children is positive and they want to make better use of the outdoor classroom experience. I also work with children covering a range of specific topics and their ability to learn and take in ideas is only bettered by their questioning interest and highhanded understanding of issues once engaged with Nature hands on. When we learn at any age we do so more successfully if we do so in a garden/green environment. When we are sick we recover more quickly if we are able to see, hear and be close to a natural green environment. To utilise the world’s outdoor classroom is easy and can only benefit all who participate. This must change, thanks for sharing Candice Gaukel Andrews!